When your personal driver picks you up at your hotel, get comfortable in your private, air-conditioned minivan and set off for a full-day of sightseeing. Your private guide will introduce you to several cultural heritage sites, starting with a visit to Tanah Lot, a 16th-century temple located about 45 minutes from southern Bali. Discover the wonders of this sea temple, one of several structures perched along a chain of rock islands along Bali’s southwestern coastline. Learn about Hindu influences and Balinese mythology en route to Taman Ayun, a royal family temple dating back to the Mengwi Kingdom. From here you’re driven another hour to Mt Batur (Kintamani Volcano) for a look at the caldera during time allotted for having lunch. Afterward, continue on to Tirta Empul, a traditional Balinese water temple built around a holy spring. Discover how the Balinese believe its sacred waters hold healing powers. 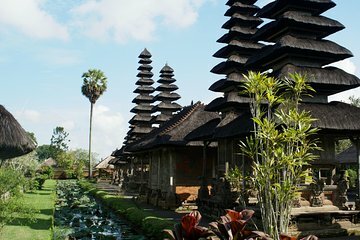 Your full-day itinerary concludes with visits to the art villages outside Ubud, including Tohpati, Celuk, Batuan and Mas. Browse for batik, gold and silver, paintings and woodcarvings before drop-off at your hotel. Great tour covering some of the most popular sites in Bali. My tour guide and driver was friendly and helpful, ensuring we covered of the full itinerary even though it took us 11 hours. I would recommend this company and guide to those looking for a general or customized tour. great experience with Viator. it's our first trip to Bali and the friendly reminder of emails from Viator make us feel cared/secured before the trip. The driver was very helpful and arrived on time to pick us up, no waste of time. When we asked him to change a bit of the tour ternary along the way he was willing to help. The whole experience contributes a great lot to our impressions on Bali. Thank you Viator, we will recommend it to our friends!